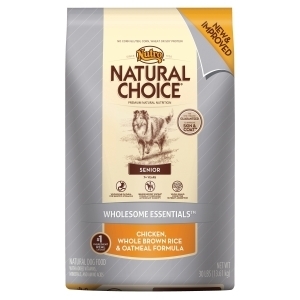 Large Breed Puppy Food with Chicken, Whole Brown Rice & Oatmeal, 15 lbs. Large breed puppies have unique needs. Whether it’s developing strong and healthy joints or ensuring overall balanced growth, they need proper nutrition to help keep them strong and active. That’s why NUTRO™ Large Breed Puppy Food uses naturally sourced glucosamine and chondroitin to promote the development of healthy cartilage. 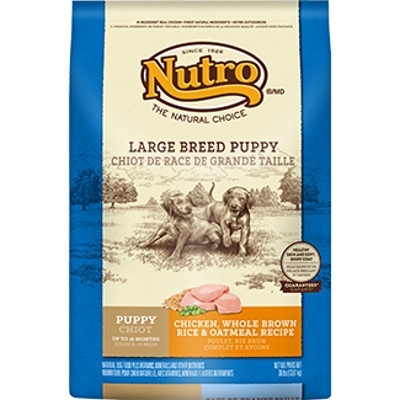 Nutro® Natural Choice® Lamb Meal and Rice natural dog food for adult dogs is formulated for 100% complete and balanced nutrition because we know they have specific needs to keep them healthy, vibrant, and active. 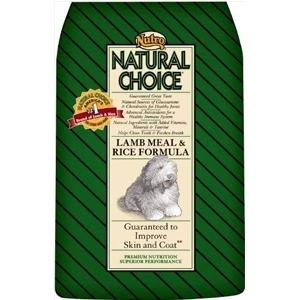 Our Lamb and Rice formula is made with premium, high-quality lamb to provide protein for muscles, and whole brown rice that makes our natural dog food more digestible for sensitive stomachs while providing the carbohydrate boost your dog needs for energy and stamina. For dogs five years and older. Guaranteed to improve skin and coat. Advanced antioxidants for a healthy immune system. Natural ingredients with added vitamins, minerals and taurine, glocosamine and condroitin for healthy joints. Helps clean teeth and freshen breath. Because of their larger frames, large breed dogs need high-quality proteins; healthy nutrients, such as glucosamine and chondroitin; and balanced levels of calcium and phosphorus to ensure proper muscle maintenance and healthy joints and bones. 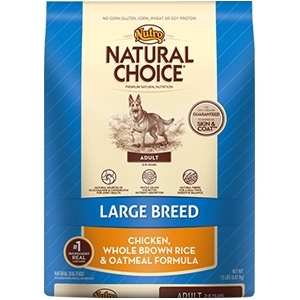 To meet their needs, NATURAL CHOICE® Large Breed Adult Dog Food is made with real, farm-raised chicken, whole grains and balanced fiber. Larger, heavier dogs need a premium dog food that supports a healthy heart and strong bones. 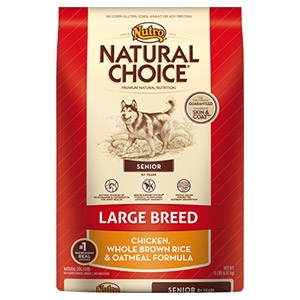 For older, large breed dogs, Natural Choice® Large Breed Senior Dog Food features our SENIOR SUPPORT SYSTEM® Formula. It contains antioxidants to maintain immunity, omega-3 fatty acids for joint health and natural sources of amino acids to support heart health. 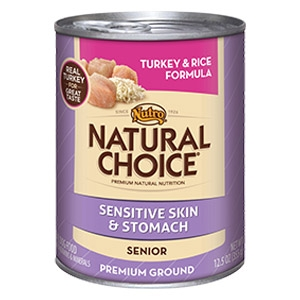 Natural Choice® Sensitive Skin and Stomach Senior Turkey & Rice Formula Premium Ground Dog Food is a natural wet dog food for senior dogs that’s scientifically formulated to provide balanced nutrition for dogs with sensitive skin and sensitive stomachs. We use natural turkey for easy digestion. 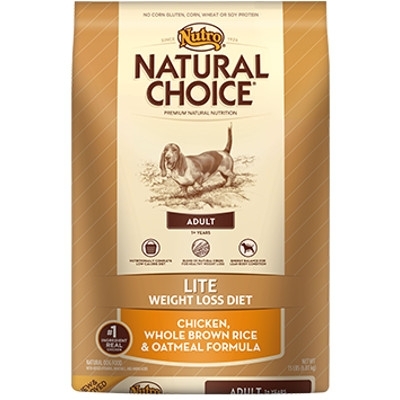 NATURAL CHOICE® Lite Adult Dog Food helps overweight dogs achieve a more healthy weight. 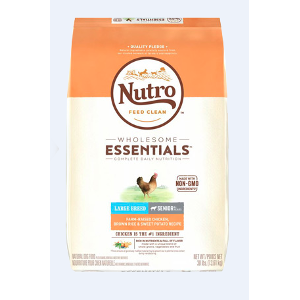 The very first ingredient in this nutritionally complete, low-calorie, natural diet dog food is U.S.-farm-raised chicken. Our weight management dog food delivers amino acids that overweight dogs need to build lean muscle and maintain a healthy metabolism. We’ve also perfected a mix of high fiber and protein to help dogs feel full, which can reduce their food intake to aid in weight loss. Think of it as all of the nutrients adult dogs need — without the extra calories. Plus, we guarantee improved taste or your money back.